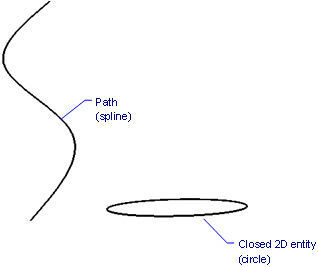 Extrudes closed and open 2D entities to 3D solids or 3D surfaces. Depending on the value of the DELOBJ (Delete Entity) system variable, the source 2D entities are either retained or deleted, or else you are prompted as to whether you want to keep or delete the source entities. When MOde is set to SOlid and you select an open 2D entity, the program does not extrude the entity, as open entities cannot be watertight. Depending on the value of the DELOBJ variable, the source entities are either retained or deleted, or else you are prompted whether you want the entities deleted or not. Specifies the height of the extrusion. 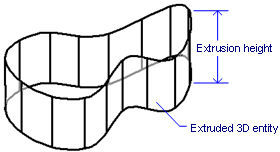 The extrusion height is measured perpendicularly to the source entity. The path entity cannot lie in the same plane as the extrusion entity. 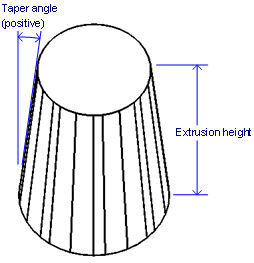 Specifies the taper angle for the extrusion; a positive angle tapers the extrusion inwardly, as shown by the illustration below. The angle must be shallow enough so that the sloping sides do not intersect after the top of the extrusion. Select the extruded solid. Notice that it has two grips. DmExtrude - creates a 3D solids by extruding closed 2D entities or regions. Loft - creates 3D solids passing through two or more cross sections. Sweep - creates a 3D solid by sweeping a closed 2D entity along a path. Interfere - creates 3D volumes of intersecting 3D solid models. Intersect - removes volumes not in common between two solid models. Revolve - revolves 2D entities into 3D solid models. Section - creates 2D regions from 3D models. Slice - cuts 3D solids into two parts. SolidEdit - edits the bodies, faces, and edges of 3D models. Subtract - removes one solid model from a second. Union - joins two or more solid models into a single entity.